Possibly the most comfortable shoes you'll ever own! Elastic fabric is woven together to create a stretchable shoe that looks great and moves comfortably with your foot. 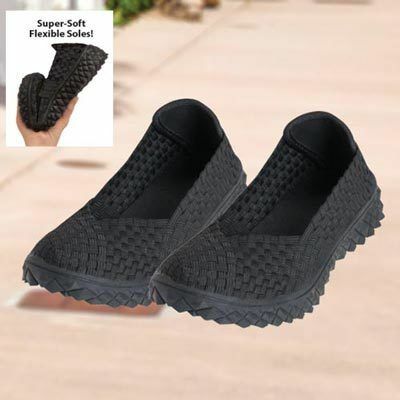 These Comfy Woven Black Shoes feature thick skid-resistant, padded rubber soles that provides cushioning for easy standing or walking. Slip-on with heel pull-strap. Imported. Available in whole sizes. Hurry! Quantities are limited!